The early American style has remained a favorite for decades, due to its dramatic, ornate designs that bring to life a storybook image of luxury and fortune. 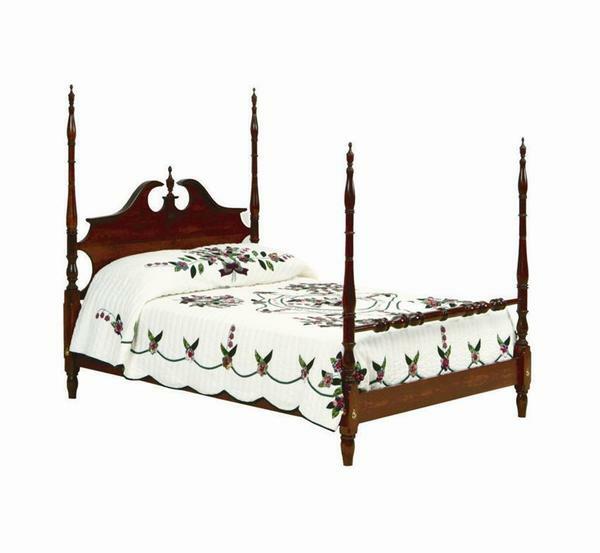 Our handmade Royal Classic Pediment Bed is no exception! Bench-built with a gorgeous flowing headboard and rolling pin foot board, surrounded by four classic turned poster legs, this bed will offer that Colonial style you've been looking for to serve as the centerpiece to your entire bedroom decor. Made to order, this bed is available in a Full, Queen, or King size. It has four different wood options, and an array of different finishes to ensure the perfect bed for your unique decor. Choose the perfect combination and let us build you an heirloom quality bed that you and your family can enjoy for many generations to come.